Greetings again from the darkness. Director Stephen Frears has enjoyed a long career by focusing on the interesting stories of people, rather than the salient specifics of history or politics. He received Oscar nominations for THE QUEEN and THE GRIFTERS, and helmed other crowd-pleasers such as MRS. HENDERSON PRESENTS, PHILOMENA, HIGH FIDELITY, and FLORENCE FOSTER JENKINS. While purely entertaining movies are always welcome, it’s important to note the filmmaker’s approach when the story is entwined with historical importance. “Based on real events … mostly” is Mr. Frears’ cutesy way of kicking off the film and asking us to enjoy the unusual story of connection between a Queen and a servant, and cut him some slack on the historical depth. 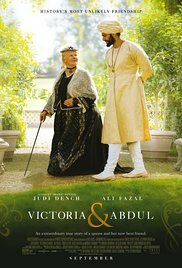 For most of us, the real enjoyment will be derived from watching yet another standout performance from Oscar winner (and 7 time nominee) Dame Judi Dench as the longest-reigning monarch, Queen Victoria in her elderly years. It’s a role she played twenty years ago in MRS. BROWN, and her relationship with John Brown (presented in that film) has some parallels to what we see here with Abdul Karim (Ali Fazal). Dame Judi is the rare actress who can capture both the loneliness and tiresome burden of six decades of rule and the re-invigorated woman we see learning a new language and new religion. She plays weary and spunky with equal believability. Victoria was Queen of the United Kingdom of Great Britain and Ireland and Empress of India, and in 1861 her beloved husband Prince Albert died. This film picks up in 1887 with the pomp and circumstance of the Golden Jubilee – a celebration of her 50 years of rule. The early scenes tease us with obstructed views, and the comedic element becomes quite obvious as we see her so carelessly slurping her soup at the formal lunch. Part of the celebration includes the presentation of an honorary coin by two Indians peasants Abdul (Fazal) and Mohammed (Adeel Akhtar), the first chosen because of his height, and the second as a last minute fill-in. Lee Hall (Oscar nominated for BILLY ELLIOT) wrote the screenplay based on the book by Shrabani Basu. The journals of Abdul Karim were only discovered in 2010, a hundred years after his death. Some of the less favorable moments of this era are mentioned, but most of the Queen’s lack of knowledge or awareness is attributed to the “boring” reports from her advisers. This leads to some awkward moments later in the film regarding the Muslim mutiny and the subsequent Fatwa. Rather than dwell on history, the film prefers to focus on the unconventional friendship and the re-awakening of the Queen. Abdul becomes her “Munshi” – a spiritual advisor and her teacher of Urda and the Koran. As you would expect, this is all quite scandalous and frustrating for those such as Prime Minister Lord Salisbury (Michael Gambon), Lady Churchill (Olivia Williams), Victoria’s son Bertie (Eddie Izzard), and the royal staff: Sir Henry (the recently deceased Tim Pigott-Smith), her physician Dr Reid (Paul Higgins), and her quivering maid Miss Phipps (Fenella Woolgar). There is even a comical sequence with the great singer Puccini (Simon Callow) as the Queen herself belts out the Gilbert and Sullivan song “I’m Called Little Buttercup”. Balmoral, the Isle of Wight, and Windsor Castle are all part of the breath-taking scenery, while the absurdity of the royal status is viewed through the eyes of the Indian servants. Most of the focus is on Victoria’s transformation from joyless, isolated monarch to the anything-but-insane (an Oscar worthy scene) and eager to engage elderly woman (one who has an entire era named after her) falling back in love with life as she fights off “the banquet of eternity”. Come for the laughs and the performance of Dame Judi … just not for a history lesson. This entry was posted on Friday, September 29th, 2017 at 8:06 am and is filed under Comedy, Drama, World Cinema/Foreign. You can follow any responses to this entry through the RSS 2.0 feed. You can leave a response, or trackback from your own site.